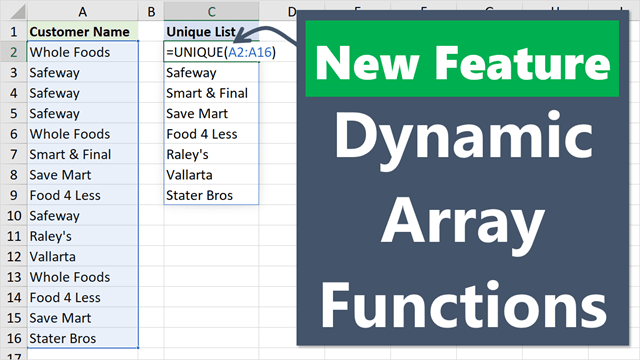 Bottom line: Learn how to create percentage change formulas in Excel with negative numbers. In my last post I shared a macro to quickly create percentage change formulas. I also explained two formulas we can use to calculate percentage change. Both of these formulas will produce the same result when the numbers are positive. The one you use is just a matter of personal preference. The goal of the percentage change formula is to allow us to make comparisons on performance between two or more items. This could be time periods, entities, categories, businesses, etc. This formula can also be used to calculate discount percentages. What if the numbers are Negative? After a bit of research, I have not found a good way to calculate the percentage change when either the old number or the new number are negative. There are definitely formulas you can use, but they seem to produce incorrect or misleading results. Net Income percent change is the change from the same period from a year ago. Percent change is not provided if either the latest period or the year-ago period contains a net loss [negative number]. On the digest page, if a company posts a profit in the latest period against a loss in the year-ago period, the percent change is represented as a “P”. Similarly, if a company posts a loss in the latest period against a profit in the year-ago period, the percent change is represented as a “L”. This article might be outdated, as I have found that recent WSJ financial pages are using the ABS method (more on that below) to calculate percentage change, but the point is that percentage change on negative numbers can produce misleading results. What about the ABS (Absolute) Method? One common way to calculate percentage change with negative numbers it to make the denominator in the formula positive. The ABS function is used in Excel to change the sign of the number to positive, or its absolute value. Technically this formula works to produce a percentage change number with the correct sign (positive/negative). However, I believe it produces misleading results. The image below contains an example of this. The Old value is negative and the New value is positive. When the value goes from -10 to 50, the amount change is +60 and percentage change is 600%. Although the calculation is technically correct because we changed the denominator (old value) to a positive number, the results don't really make sense to me. If you were just looking at the percentage change numbers, you would think that Coffee did better than Cakes. When in reality Cakes made a huge gain in profit over the prior period, much larger than Coffee. The same issue happens when the numerator (new value) is negative. Here is another example that produces misleading results. In this example Cakes had a larger negative value change, but smaller percentage change than Coffee. But I've Always used the ABS Method!!! I know, me too. I've seen this method used throughout my career, and it looks like the Wall Street Journal is even using it. I spotted it in some of their growth metrics on this page of Bank of America financials. Here are a few ways to test for the presence of a negative number, and provide an alternate result. The first thing we can do is check if either number is negative, and then display some text to tell the reader a percentage change calculation could not be made. The following formula does this with an IF function and MIN function. The logical test of the IF function (MIN(old value, new value)<=0) finds the minimum of the two values and tests if the value is less than or equal to zero. The result will either be TRUE or FALSE. If the result is TRUE, then a negative number (or zero) exists. In this case we can display some text to tell the reader. This can be anything you want. I just used two dashes “–“. You could also have it return an N/A error with the NA() function, or any other text that lets the reader know the percentage change could not be calculated. If the result is FALSE, then the percentage change formula is used to return the percentage change on the two positive numbers. This formula also handles the divide by zero (#DIV/0! ), so we don't have to wrap it in the IFERROR function. The Wall Street Journal guide says that its earning reports display a “P” or “L” if there is a negative number and the company posted a profit or loss. We could use this same methodology to tell our readers if the change was positive (P) or negative (N) when either value is negative. The following formula tests for this with an additional IF function. We start with the same logical test to determine if a negative value exists using the MIN function. A second IF function is then used to determine if the change from old to new is positive or negative. This IF statement returns a “P” for a positive change and an “N” for a negative change. If both numbers are positive then the percentage change formula is used to display the result. Other Methods for Percentage Change with Negatives? 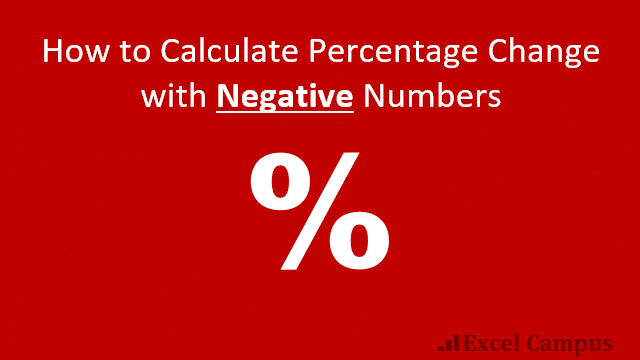 Calculating the percentage change when negative numbers are involved is not easy. The ABS method is probably the most commonly used, but it can produce misleading results. Do you have any other methods for this calculation? Can we further simplify either of the methods above? I'm interested to hear your thoughts. Please leave a comment below with questions or suggestions. Thanks! Two more things to point out. First, something interesting, WolframAlpha returns -5100% (decrease) for -1 to 50. It appears they don’t use abs in formula. Second, something to be aware of are the problems of going from 0 to some number or vice versa when calculating percent change. Thanks Bob! That’s interesting that Wolfram Alpha is not using the ABS method. I sent WolframAlpha a note to see what their thoughts are on the topic. Who knows if I’ll ever hear back. Thanks for your post. You are doing good work. This is so wrong in so many levels. ALWAYS. AND NEVER CREATES MISLEADING RESULTS. The OP did an error on his calculations when he says it creates misleading results. “When the value goes from -10 to 50, the amount change is +60 and percentage change is 600%. That’s because in the first case your initial value was -10, so any increase would be in relation with its initial value. That’s why if you divide the amount change +60 by 10 (the initial value). You get =60/10 = 6 = 600%. But when your initial value is -60, any increase is in relation with your initial value of 60. So you move in fractions of 60 any increase or decrease. That’s why if you divide the amount change +110 by 60 (the initial value). You get =110/60 = 1,833 = 183,33%. If the amount change would have been 120, then the increase would have been 200% but it didn’t made it to 120, it just made it to 110, that’s why is a little less than 200% the increase (183,33%). The answer is correct, that’s why in reality coffee yes did better than cakes (in percentage increase not absolute value). Hope it helps and this stop confusing more people. But I don’t see how your argument changes what I already presented. If we go from -1 to 50 with the ABS method, the percentage change is 5,100%. -10 to 50 is 600%. An amount change of 120 in this scenario means the old value would be -70. In that case the % change with the ABS method would be 171%, not 200%. The larger the negative number relative to the positive number, the smaller the % change will be with the ABS method. Another way to think about it is if you were hiking and started 10 feet below sea level, then hiked 50 feet above sea level. The ABS method says that distance is a greater percent change then starting 500 feet below sea level and hiking 50 feet above. As I mentioned in the article, I understand the math, but the presentation of the numbers can be misleading without explanation or supporting data. Sorry for the late respond. I understand that you are saying that the results are misleading, but they are not, not at all. Te results are correct, what is not correct is actually the way you are seeing percentage changes. We can say that a percentage change is: the extent to which a variable gains or loses intensity, magnitude, or value. In comparison to its initial value (key point is initial value). On the contrary, when you say: “An amount change of 120 in this scenario means the old value would be -70. In that case the % change with the ABS method would be 171%, not 200%.”. Yes, the amount of change from -70 to 50 is 120, but the percentage change is in relation to what initial value? -1 or -70. In this case -70. When -70 moves one time itself that’s a 100% change or 70 units, and then another 50 to get to 120, that would be 50/70 = 71% another 71% change. Thats why in total a change from -70 to 50 is and increase of 100% + 71% = 171%. What I am trying to say is that, is not the same for 1 to move to 2. In that case it increases in 100% because it doubles its values, but if you have 70 and increase it to 71, it increases in as little as 1,4%, because 1 in relation to 70 is just a little value, but 1 in respect to 1 is its total value. In another example, if you weight 100 lb and you gain weight to 110 lb, you increase your weight in 10% because 10lb is the 10% of 100. But if you weight 20lb and you gain weight to 30 lb, you increase your weight in 50%! because 10lb are the 50% of 20 lb. Its the same 10 lb of weight gain, but the only difference is what is 10 lb of weight change in relation to different initial values 20 lb or 100 lb. I hope I was clear with my explanation. Your explanation makes no sense. Maybe you are right but I would challenge you to give a real life example and actually try to explain it. When the value goes from -60 to 50, the amount change is +110 and percentage change is 183.3%. So you are saying you would rather go from -10 to 50? Maybe the misleading part is that in general percentage change should not be presented alone (it should include the number change) but nevertheless it is still misleading. This will produce a negative % delta using ABS. "New" indicates new activity that wasn't present during the previous period. You can just add x to the NEW and the OLD. If x is big enough to shift them both to positive. New Summ	0	60	#DIV/0! – How to deal with #DIV/0! and #N/A issues while still communicating what happened with the dollars (I chose pretty bland descriptions for the weird results, as you’ll see. Replace the text with whatever you think is good). Not included in this formula, but still worth noting – I use conditional formatting color scales to visually show the percentage ranges among the broader data, like on cash flows or P&L’s. I think it helps managers put the results in perspective. Here you go, this has been working for me for awhile, and it’s a mess, but just throw it in Excel and test it out. Hope this works for you all! Do we have a final verdict? Over and beyonf this how about when you are dealing with Cumulative Annual Growth Rates (CAGR) for a period of more than 2 years as well as both positive and negative numbers. Does anyone know how to deal with this? Excel ends up with the same #NUM error caused by finding the nth root of a negative number. How can I calculate the original value with only the percentage change and the final value. PRICE QUOTED	PERCENT HIGH/LOW	What is original price? I read your comments but still can’t figure out how to solve my issue. I am calculating delta% out of 2 negative profits. I can’t understand why this happens, as it’s clear that there is an increase of 631118. Why the % is negative. I see like 300% increase. How to calculate CAGR , when the beginning number is negative ? While in math, a negative percentage change might not be worth considering, in finance it is. Consider this: Year 1 (Y1) I spend $100 more than I make (-$100), but Year 2 (Y2) I make $200 more than I spend. That’s a difference of $300 (or 300% change). It’s important to be able to meaningfully track these growth/change rates, even if the change involves negative numbers. After trying some of the formulas above, I believe I found a simple solution that as far as I can tell always works, even when calculating change in percentages. There are 8 conditions to consider, but only two outcomes: a positive ratio or a negative ratio. Half of the conditions result in a simple Y2/Y1 formula, the other half in a -(Y2/Y1) formula. However, in both sets, conditions 3 and 4 are identical, so there are only 3 conditions (not 4) for each set. You can substitute the A3 part with (A2-A1), but I find it's useful to be able to actually see the difference as part of the error correction process, and breaking it out simplifies the final formula. I don’t see how that’s a misleading result because the percentage changes are generated for different base values. we are not supposed to compare like that. Here is the formula I came up with. Hope it helps someone. Everyone’s input here helped me. So what is happening is first we determine the percent change and then create an absolute number. Next we multiply that by a -1 or +1 depending on whether the new number is less than the old or not. Your formula does not work. Its invalid for an If function. its not an excel problem. its a statistics one. please try to understand the gap from old to new and for higher gap result should be higher %age and vice versa. There are actually 6 conditions not just 3. Apologies if my solution has already been posted, I’m undeniably lazy by not checking everyone’s comments. For lazy people: where the numbers are positive it does a standard %, where both numbers are negative it reverses the formula, and where the budget is negative but the result positive it uses the abs. It does open me up to DIV/0 errors, so I've wrapped it in an iferror on my actual sheet, although from a practical perspective this is unlikely given the nature of my sheet. And in the event that the result is negative but the budget positive, I get the correct output if not the mathematically correct answer – so I'm not losing sleep over that aspect. The formula provided in this page really helped me. But I have one question regarding formula with ABS. I think this formula doesn’t give misleading result. In above example, though the change between old and new values has increased, the old value has also increased compared to old value of previous row. So, the percent change has not increased as per increase in value. I had a situation, where the turnover was negative but the cost price was in the positive. What I had to do, was try and use the GPS. But it got complicated when I did a recon with several positive GP’s and a negative GP. Nobody can seem to help me with this. How about =IFERROR((C2-B2)/ABS(B2),IF(C2=0,”-“,IF(C2>0,1,-1))) , where C2 is NEW VALUE and B2 is OLD VALUE ? What is the old value is zero and the new is 60? Excel gives an error, other sites claim the % increase is “infinity”. How do I explain that? The results look reasonable, but it is hard to test the negatives. In my old days, I would try to do a mathematical proof to test, but I'm afraid it is over my head now!! For % change, what about this crazy nested if statement? The results look reasonable and they are positive and negative when they should be, but I'm assuming if industry just doesn't bother doing it, there isn't a simple solution??? Hi Jon, can you tell me if I am calculating his right? It seem like Growth rate should be positive. I tried your formula and still came out with a negative. As I mention in the article, going from negative to positive tends to lead to misleading results. There are a few alternate solutions posted in the comments here, but the formulas get a bit complex. Thanks! been handling y-o-y percentages and stumbled upon the same problem…I hope it makes sense to you and only works if the starting value is negative and the end value is positive…I think reversing the initial and end values then multiplying the result by -1 would show a more logical result… say your initial value is -23 and it grew to 79 over a stated period of time… by switching their position the formula would show (-23-79)/79 which would result to a -129% which you would then multiply by -1 so 129%. Going from a negative to a positive does make sense. It doesn’t give misleading results at all, in fact it gives the exact results you’d expect. Your first excel sheet example when you compare coffee and cakes you say it doesn’t make sense? Well yeah it makes sense, why would anyone think cakes did better than coffee? Coffee obviously did way better than cakes. the profit increase DOES NOT matter here. When seeing who did better you look at by what FACTOR did it increase. Coffee goes from -10 to 50, so it increases by a factor of 6, which is very impressive (hence the 600%). Cakes did not do that good, they went from -60 to 50. They did not even increase by a factor of 2 but in fact was just shy of that. (hence the 183%). The amount change DOES NOT MATTER, only the factor by how much the starting amount increases. This is the same as stocks. How is a change from -10 to 50 a much more impressive than a change from -60 to 50? You said that “only the factor by how much the starting amount increases” matters. -60 is a much smaller number than -10, which means that the factor by how much the starting amount increases is much greater with the cakes than with the coffee. You are treating the negative and positive numbers as if they were the same, but they’re not. When do you go from a negative stock price to a positive stock price or vice versa to calculate percentage change? I am not sure you are using common sense here or maybe this is one of those counter intuitive things like the Monty Hall problem. This has caused me issues in the past so thought i’d have a go at trying to solve! Please let me know if you think i have cracked it! Thanks for sharing your solution! I haven’t had a chance to fully evaluate the formula yet, but based on your list of results it looks like it works. When I look at the formula it seems like it could be simplified a bit, but maybe I need to study the logic further. Maybe you can explain it further. I tested it against yours with positive numbers, negative numbers, and zeros in both columns and it produces the same result in each instance. Let’s not lose hope. This is still wrong. If it’s still relevant.. The percentage is not relative to the value/weight of the change but only to itself. And this is the same with positive number. ex: 1 to 3 will result in 200% change; 10 to 17 will result in 70% change. Although 17-10 > 3-1. Same thing goes with -5 to 10 (300%) VS -1 to 10 (1100%). Therefore your pct number is not always representative of weight/chg value. To solve this, I believe you’d have to enter a new parameter. If the SUM of the OLD qty is positive like in your example, you could use this and the change column to compare weight towards total growth. ex: Sum up the OLD # of items in your last table, which gives +30. Divide the change column by this number to have the % of weight toward growth. In this example your -5 to 10 would be greater than -1 to 10. Another way would be to Nest IF() functions and setup the different formulas for negatives, positives, zeroes, etc. As the numerator decreases, and denominator increases, why is the percentage change increases? Ignore my last comment. Upon re-reading it, I see you are mentioning this formula in your article. where a1 is the current value and b1 is the prior value. The negative to positive or positive to negative scenarios are where the formula produces misleading results. Going from -5 to 10 = 300%, this is a change of 15. Going from -1 to 10 = 1100%, this is a change of 11. If you were to look at the percentages without the numbers, an 1100% increase would look better than a 300% increase. However, the 300% increase was actually a bigger change in terms of whole numbers. I’m sure we could argue that the math is correct, but if we are only looking at percentages then we might miss something significant. Where Y17957 is the old value and Z17957 is the new value. Hey, looks like this one works! Need to test a bit more but looks like this is it. Well done! Thank you! Tested this formula with the series used in the example for ABS formula above and both SIGN and ABS gave exactly the same results. this formula applied to all rows returns results that seem to provide percentages that represent the correct directional change. Thanks for the suggestion John! I see an issue when the numberator (new number) is negative. I tried it on the Negative Numerator tab in the example file and still see misleading results. I wonder if I’m missing something by using this method. Can you spot any limitation? I believe that would be the same result as the ABS method. The SIGN function is just going to return a negative 1 if the sign of the denominator (B1) is negative. A negative multiplied by a negative is a positive. So this is the same result as using ABS to return the absolute value of the denominator. Thanks for posting this Mark! I believe the last AND function is missing some text. AND(B40) doesn’t look right. Should it be B4<0? Do you have another condition there for the AND function? Anmol’s fornula is the right one, I guess, am I right? I haven’t worked out the formula yet but it seems to me in the “Cakes” example above the value of the change is 110, so the percent change between -60 and 50 would be the equivalent % change between 0 and 110. In this case the ABS value of the negative number could be added to both sides (so we’d have 160+60 = 0, 50+60=110), so the calc would be done between 0 and 110. Am I on the right track? I understand where you are going with that. The issue I see is that we can’t really calculate the percentage change between 0 and 110. You would then get the divide by zero error. If you were to change the 0 to 1, then you would get a percentage change of 10,900%. This produces misleading results as well. Thanks for leaving a comment though. It’s tough to find a solution for this calculation. It works, except I need to rearrange it so the check for Both is at the front instead of the back of the formula. Please fool with it and see if it's the way to go. I think it is. I think if we can put all three conditions together with the base formula we'll be there.